Cliff Lee’s been the talk of baseball during this postseason. Tim Lincecum had a 14-strike-out game earlier in the postseason and is a two-time Cy Young Award-winner. You’d expect a pitchers duel between two of the best pitchers in baseball. What happened was an offensive explosion as the Giants piled up double digits in hits and runs, offsetting double-digit strikeouts to beat the Rangers 11-7. 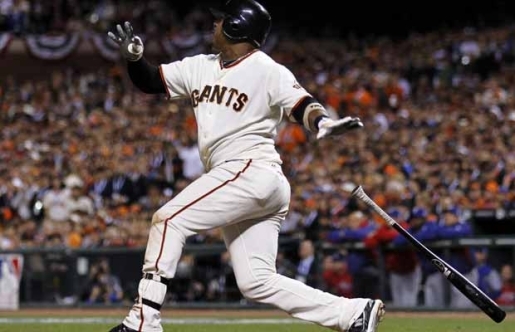 Juan Uribe’s three-run homer earned some lucky customers at San Francisco’s ReLeaf Herbal Center some free joints AND a discount on medical marijuana, to boot. The medical marijuana dispenser has come down with baseball fever, and every customer present in the store at the time the Giants hit a home run gets a free joint and a discount on some bright-orange Giants-themed marijuana. Cheech and Chong approve. ”It wasn’t quite the game we thought it would be,” said Giants manager Bruce Bochy, a master of the art of the understatement. ”Great pitchers, sometimes they’re a little bit off.” Cliff Lee was off from the very first pitch last night, and was out of the game before the end of the fifth inning. The Giants become the fourth team in World Series history to win a World Series game with double-digit hits, runs, and strike-outs; the 18 total runs scored is the second-highest total in World Series history.